Retail Management refers to the various processes, which help the customers obtain the desired products from the retail store. The purview of retail management extends to customer satisfaction by ensuring that all of customers’ buying needs are fulfilled, with greatest of ease and comfort. It also includes all the steps involved in bringing the customers into the store. 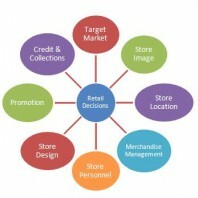 Following are some of the aspects of retail management. This refers to the look and feel of the store. The store design is a very important aspect in attracting customers to the store. Some retailers place their perfumes and cosmetics sections right near the entrance. This is a very good idea, as it gives lovely, fragrant ambience as the customer enters the store. The store design should ensure that there is enough aisle space for the customer to walk around comfortably, while browsing through the products. If you deal in apparel, have adequate trial rooms with requisite lighting and other facilities. Some retailers provide day and night lighting in the trial rooms to help the customer make the final buying decisions. If you are a book store, you could provide reading chairs or sofas to enable customers sit and spend time in the store and positively enhance their overall experience. Visual merchandizing refers to the promotion of sales of a product by means of arranging an attractive and creative display. The visual merchandiser is responsible for the in store display. Since majority of the customers are right handed, it would make sense to have attractive displays on the right side to arouse the curiosity of the customers. The display may be centered on a theme that may be seasonal such as ‘winter’ or ‘rains’. Or the display could focus on a particular range of products like say, electronics or children’s books. The responsibility of the visual merchandiser also extends to ensuring that the customer’s shopping experience is ‘visually appealing’. For instance, if you deal with apparel, ensure that all products are shelved properly according to size. If necessary, mark the sizes on the shelves or the hangers. Customers rarely clean up after themselves. Instruct staff to sort out the apparel left behind in the proper shelves, so as not to inconvenience the next customer. Your store employees are the most valuable resource in retail management as they are directly in contact with the customers. The most important aspect in retail management that employees have to imbibe is customer satisfaction. This customer satisfaction policy has to be adhered to right from the top management. All new recruits should be made to go through adequate customer service training to understand their role better. While the customer is not always right, it is necessary to put this point across to the customer in a professional manner without offending the customer. Last but not the least, all retail professionals require tremendous patience to deal with various queries of customers, all the while, retaining a smile on their faces.